Texas Governor Greg Abbott has said he fears of severe flooding as the rains from Tropical Storm Harvey continue to lash the state. The governor said the cities of Houston and Corpus Christi had already received as much as 20in of rain. Greg Abbott said another 40in of rain could be due before the storm subsides midweek. Rescue efforts are being hampered by strong winds and thousands are without power. Two deaths have been confirmed, in the Rockport area and Houston. In Aransas County, where Rockport is the chief town, a person died in a house fire on August 25. A woman died in Houston as she drove through flooded streets on August 26. Houston, the fourth biggest city in the US, could see 2in-3in of a rain an hour on Saturday night, Mayor Sylvester Turner said. According to officials, about 4,500 inmates from prisons south of Houston are being evacuated to other prisons in east Texas because the Brazos River nearby is rising significantly. Harvey began as a major category 4 hurricane – the first to make landfall in the US in 12 years – before it was downgraded to a tropical storm later on August 26. Governor Abbott warned of the “potential for very dramatic flooding” from the storm while expanding a declaration of emergency in the state from 30 counties to 50. He has mobilized 1,800 military personnel to help with rescue and repair operations. Forecasts say that up to 40in of rain could fall in some areas of the middle and upper Texas coast, the hurricane center (NHC) warned. Such precipitation could trigger flooding in low-lying areas and near water outlets and rivers. The National Weather Service cautioned that the storm was so severe that many areas could be uninhabitable for months. Harvey has now mostly moved inland, officials say, with several places already reported to have received well over 10in of rain. However, coastal areas will also be flooded by storm surges during high tide, the NHC said. Meteorologist Wendy Wong told the Houston Chronicle that at least seven tornadoes stemming from the hurricane had struck the Houston area between Friday evening and Saturday afternoon. The tornadoes destroyed buildings and homes and are likely to continue throughout Sunday and Monday. Earlier, Hurricane Harvey made a double landfall: north-east of the city of Corpus Christi initially late on Friday local time, then just north of Rockport a few hours later. When Harvey struck close to Corpus Christi it had winds of up to 130mph, but by noon its sustained winds had dropped to 70mph – therefore becoming a tropical storm. It was moving at an extremely low speed – 2mph. The port of Corpus Christi – which closed on August 24 in preparation for the storm – only received “minor damage”. Its navigation channel is due to reopen after a survey is completed by engineers. Texas City also expects to open its port within 48 hours. Utility companies say nearly 300,000 customers have been without electricity. President Donald Trump has freed up federal aid for the worst-affected areas and Governor Greg Abbott praised the administration for “stepping up”. In a teleconference with cabinet members, President Trump “emphasized his expectations that all departments and agencies stay fully engaged and positioned to support his number one priority of saving lives”, the White House said. At least 18 people have been rescued from vessels in distress by Coast Guard helicopters. 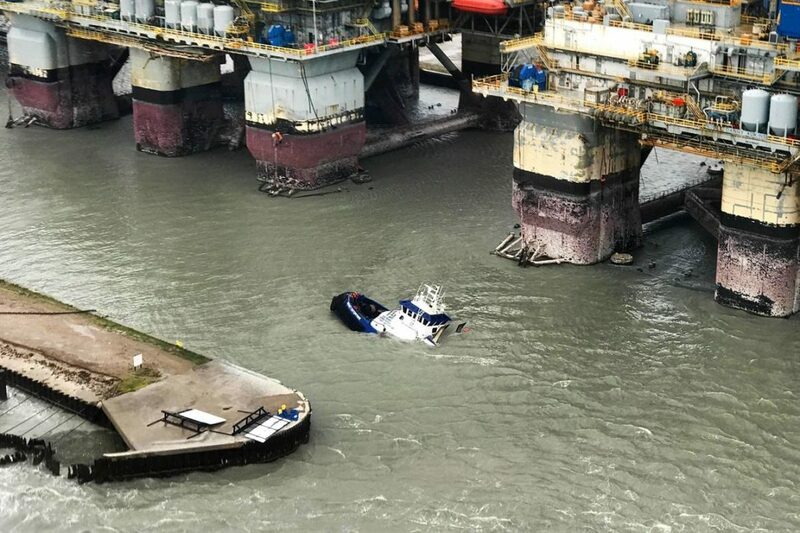 ABC News has tweeted a video of four people being rescued off the coast of Port Aransas. Rockport, normally home to about 10,000 people, appears to have been the hardest hit town. Port Aransas, a city on Mustang Island, near Corpus Christi, is also reported to have extensive damage. Local media reports say a search and rescue operation is under way at a trailer park. President Trump is likely to visit Texas early next week, the White House said. According to the Houston Chronicle, Harvey is the strongest storm to hit the US since Charley in August 2004 and the most powerful to hit Texas since Hurricane Carla in 1961, which killed 34 people.